Cyprus, the island of Saints, has endured many trials and tribulations, the most recent of which has been the banking crisis. Throughout Lent, I worried about my younger sister and her family in Cyprus and continue to be concerned about the years of hardship ahead for the people there. It has been the worst crisis since the Turkish invasion of 1974. 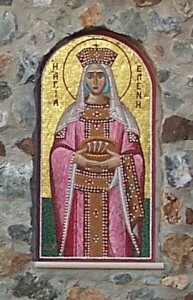 Before Saint Helena brought the Holy Cross to Cyprus, the country was desolate, drought ravaged and deserted. According to the 15th century Cypriot historian and chronicler, Leontios Makhairas, the island had been without rain for 36 years. There was great hardship and famine and the people deserted the island, which became overrun with poisonous snakes. 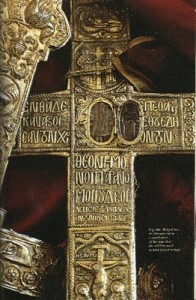 At that time, Constantine the Great commanded his saintly mother to find the Holy Cross in Jerusalem. She traveled to the Holy land and found the Holy Cross and the two crosses of the thieves, the nails, crown of thorns and the rope used to bind Christ. She built many churches in Jerusalem over sacred places in the name of the precious and Life giving Cross. Imagine the fire lit beacons on the highest towers from Jerusalem to Constantinople, proclaiming that the Holy Cross had been found! What an awesome sight that must have been. 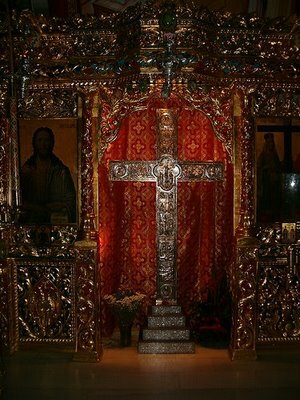 When Saint Helena found the Holy Cross, she placed it with the two crosses of the thieves in a chest with the nails, crown and rope and departed for Constantinople but by God’s will was shipwrecked in Cyprus in 327 AD. 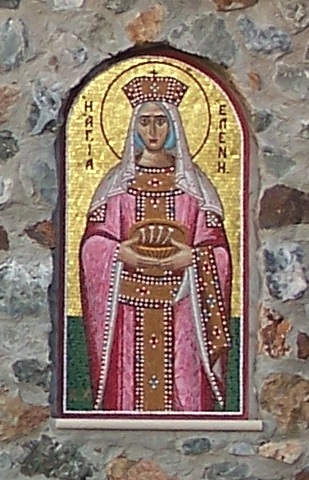 Saint Helena saw a pillar of fire from earth to the sky and a voice from heaven told her to build a church at Tochni, which she did and a bridge for people to cross over. She left a piece of the Holy Wood there in a cross which she overlaid with silver, gold and pearls. 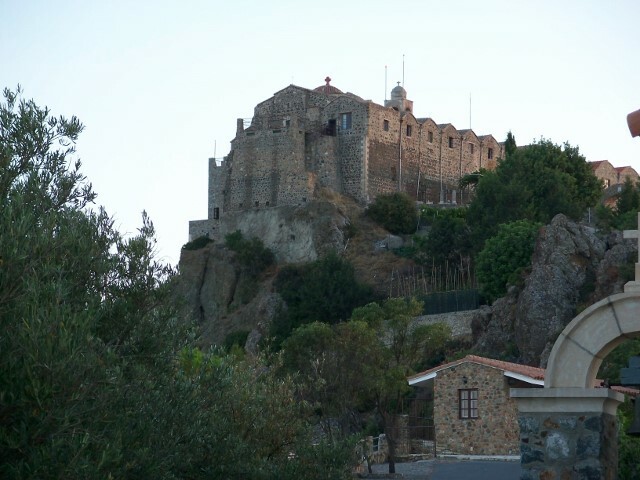 She also built a church at Omodhos where she left a piece of the blood stained rope used in Christ’s passion. From the time when Saint Helena brought the Holy Cross to Cyprus, the rains came and nourished the land. There was material and spiritual renewal. 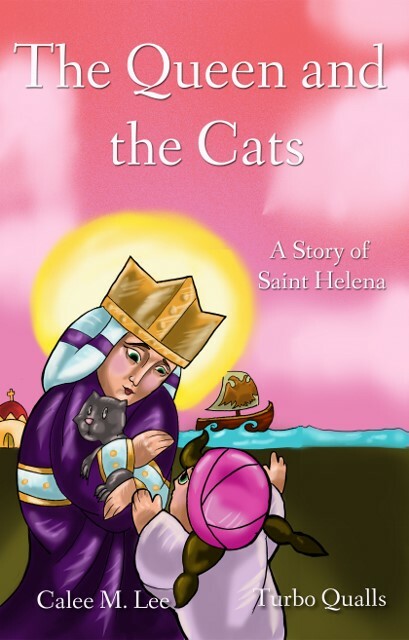 Saint Helena ordered a boatload of feral cats from Asia Minor to Cyprus landing at Cape Gata (cat) to kill the poisonous snakes. Many cats were at a Monastery now known as St Nicholas of the Cats. And then the people returned. This story is told beautifully by Calee Lee in her children’s book, The Queen and The Cats. 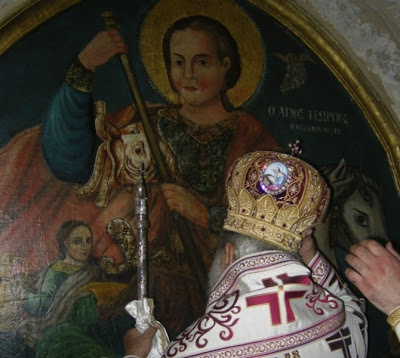 In the midst of Cyprus’ struggles today, the Lord has sent two recent miracles to give hope to the long-suffering Orthodox faithful – two myrrh streaming icons of Saint George. 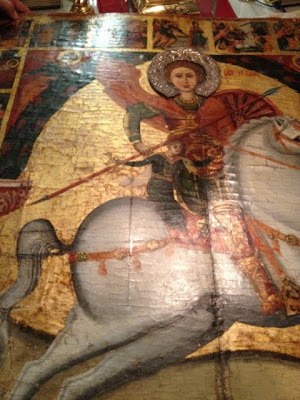 The first one was at Kambia, Farmaka and began “gushing” myrrh on Bright Monday, on the transferred feast of Saint George. Read more about this icon here. And a personal testimony here. The second is at the Sacred Monastery of Saint George outside Larnaca. 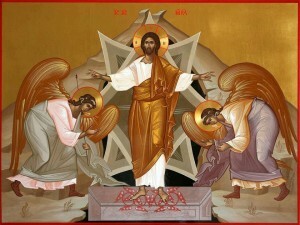 This also appeared to“gush” myrrh around the same time.Read more here. The Angels in Heaven, O Christ our Saviour, sing of Thy Resurrection; enable also us on earth with pure hearts to glorify Thee. First published on The Sounding Blog, May 20 2013.